RICHMOND, Va.—Go in search of the tea party movement that rose up in opposition to the policies of President Barack Obama, and you won’t get the full picture if you fixate on political rallies and protests. That’s because many tea party activists have been burrowing into state legislative houses across the nation, where their membership has developed expertise on a wide range of public policy questions. 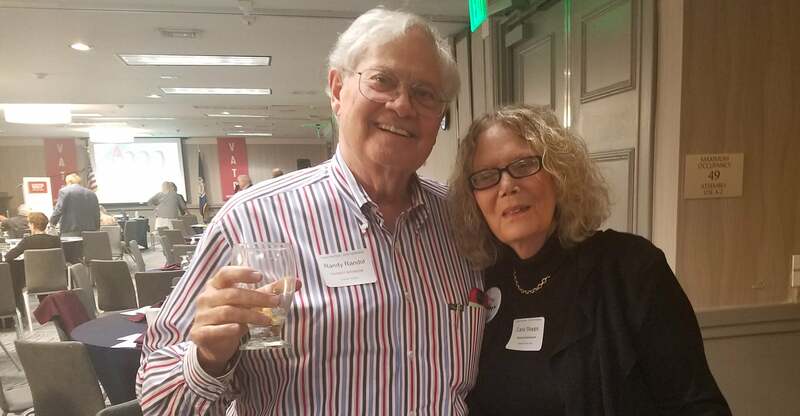 With an eye toward the Virginia General Assembly session that begins in January, about 200 Virginia Tea Party members who gathered here at a downtown hotel Sept. 22 describe how their movement has “morphed” since its inception in 2009. 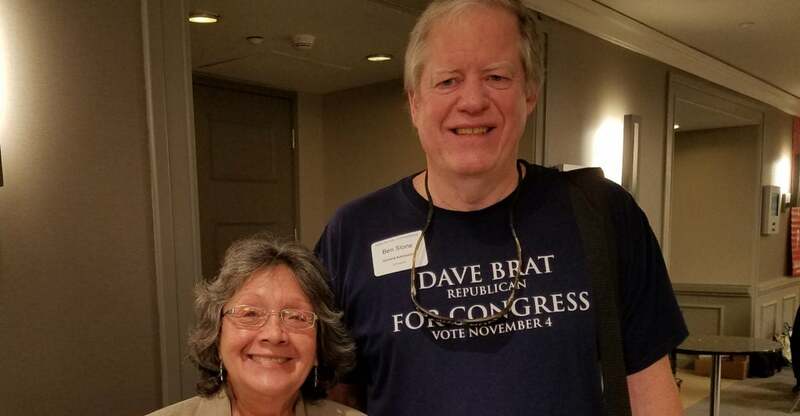 Instead of staging rallies in front of the Capitol in Washington or various statehouses, the tea party is focused on legislative initiatives that will have a more lasting impact, attendees of the Virginia Tea Party’s fall summit meeting told The Daily Signal. Mark Daugherty, a retired Wall Street financial analyst who resides in Augusta County, was there at the moment of creation when the tea party coalesced into a real movement. Daugherty, 63, recalls the first statewide meeting in October 2009 in Hanover County, and a larger rally of about 3,000 at the Greater Richmond Convention Center in October 2010. In 2012-13, Daugherty was chairman of the Virginia Tea Party Federation, a predecessor to what became the Virginia Tea Party. He says he sees the movement putting itself into position to make lasting policy changes. But I’m most impressed with what’s happening now with legislative action efforts, where a tea party position is developed on different bills. This involves contacting delegates and state senators to make their position known, and in some cases the tea party has actually had a hand in authoring certain bills. The tea party movement takes its name from the Boston Tea Party of December 16, 1773, when American colonists protested British taxation by dumping tea in the Boston Harbor. The modern tea party focuses on fiscal issues and works to oppose what it views as excessive levels of taxation, spending, and regulation. In an effort called Cooperative Legislative Action, teams of tea party activists in Virginia get started early in examining legislative proposals, and make a few of their own. 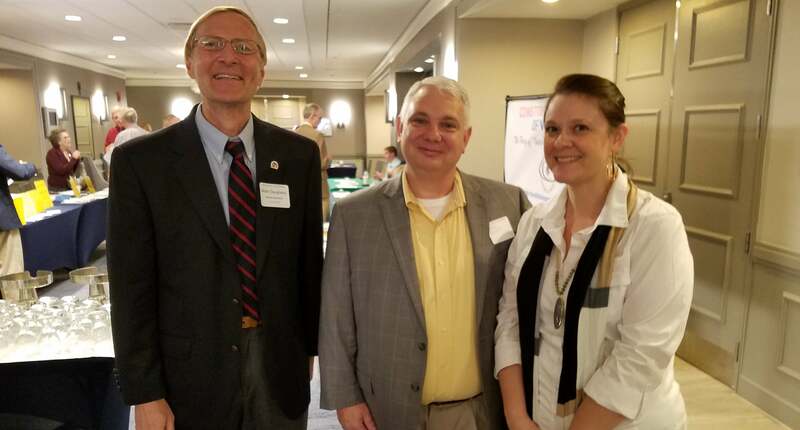 Joining Daugherty at the summit are Chris and Diana Shores of Farmville, who say they are keen on the tea party’s heightened role in formulating legislation. Chris Shores, 44, identifies himself as a consultant and Diana Shores, 39, is a homeschooling mother and education activist. 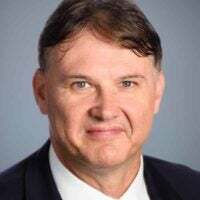 He is pleased to see tea party candidates running in Virginia and getting elected to school boards and boards of supervisors and as overseers of soil and water conservation districts. Randy Randol of Alexandria is the Virginia Tea Party’s consultant on energy and environment policy. Carol Stopps of Richmond is chairman of the party’s Cooperative Legislative Action effort. 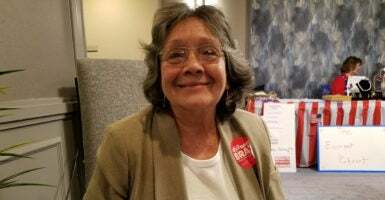 Susan Lascolette, a member of the Richmond Tea Party, is one of those elected officials. Lascolette, 68, ran successfully for a seat on the Goochland County Board of Supervisors in 2011 and is still there. I think the tea party has morphed since 2009 and we have come a long way since that time. I joined the tea party in 2009 out of frustration over what we saw in government. I had never been active, but always voted. Over time, we realized we can’t just be protesters. We have to try to affect legislation and get elected. For this reason, I don’t think what the tea party does now is as noticeable in front of the camera. We’ve gotten more involved in policymaking. Carol Stopps, a Richmond resident, chairs the state party’s Cooperative Legislative Action effort. She says she anticipates about 3,000 bills moving through the General Assembly next year and wants her team to maintain its focus. Stopps and other tea party activists say they have blocked attempts to water down election integrity measures and efforts to limit school choice. Randy Randol, an Alexandria resident, analyzes energy and environmental issues for the Virginia Tea Party. His major concern now is the effort of Gov. Ralph Northam, a Democrat, to join a pact called the Regional Greenhouse Gas Initiative without legislative approval. Known as RGGI, it is a multistate agreement that commits states to impose caps on carbon dioxide emissions from coal-fired power plants in an effort to counter climate change. Member states include Connecticut, Delaware, Maine, Maryland, Massachusetts, New Hampshire, New York, Rhode Island, and Vermont. In addition to Virginia, New Jersey may rejoin the pact. Bookstore owner Nelson Velez, left, and former Navy pilot George Mears of the Tidewater Tea Party Alliance. George Mears of Tidewater, who served as a Navy pilot for 23 years, also worked as an engineer, hydrogeologist, and project manager for the Army Corps of Engineers for 17 years. As a member of the Tidewater Tea Party Alliance, Mears is outspoken in challenging what he calls the “alarmist claims” and “junk science” behind RGGI. Water vapor makes up 95 percent of the greenhouse gases, but government officials can’t tax water vapor and they can’t tax the sun. So, they pick carbon dioxide, which is incidentally tied to climate, but the human contribution to carbon dioxide is very small; it’s mostly naturally occurring. So, the whole premise of RGGI is flawed. 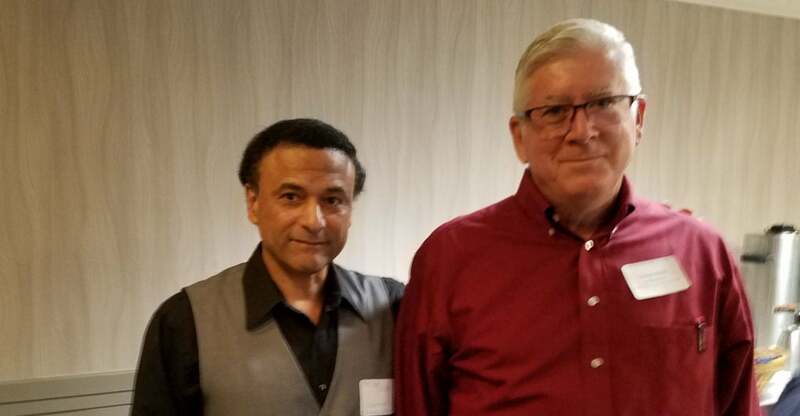 Nelson Velez, another member of the Tidewater Tea Party Alliance, says he is concerned about the prospects for constitutional, limited government in Virginia. “When you look at Northern Virginia, you have the spillover from Washington, D.C., and this means a lot of government bureaucrats residing in that part of the state,” Velez, 60, says. Ben Slone towers over Susan Lascolette, a fellow resident of Goochland County. Ben Slone, a major shareholder in a Virginia-based information technology company who lives in Goochland County, says he is more optimistic. One legislative victory claimed by the Virginia Tea Party is passage of a voter identification measure requiring voters to present a valid photo ID at the polls. Signed into law in 2012 by then-Gov. Bob McDonnell, a Republican, it has been upheld in the courts. Reagan George of Chantilly, a retired international management consultant, is president of the Virginia Voters Alliance. Reagan George of Chantilly is president of the Virginia Voters Alliance, a group dedicated to preserving ballot integrity. 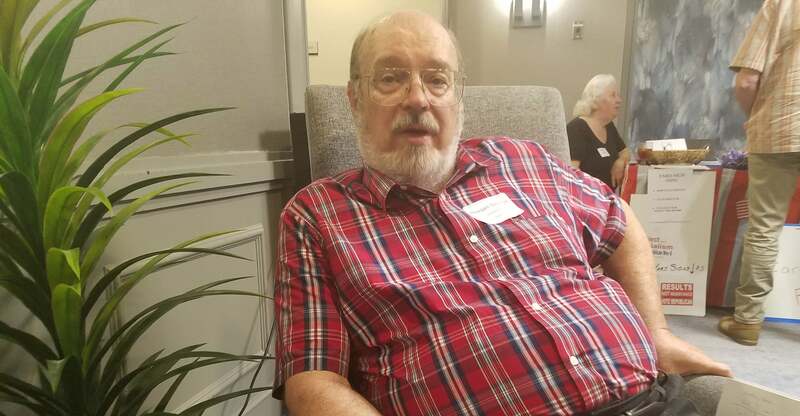 George, 71, who is also active with the Virginia Tea Party, warns that some lawmakers have worked to dilute the voter ID law’s requirements by lowering standards. However, George says he still sees the law as offering “some protection” against voter fraud. He cites figures showing that tens of thousands of ineligible voters have been removed from the rolls, thanks to the efforts of volunteers with his organization. John Bloom of Newport News, right, is a Norfolk Naval Shipyard worker who is chairman of the Virginia Constitution Party. With him is Agriculture Department retiree Paul Provance of Burke, the party’s vice chairman. 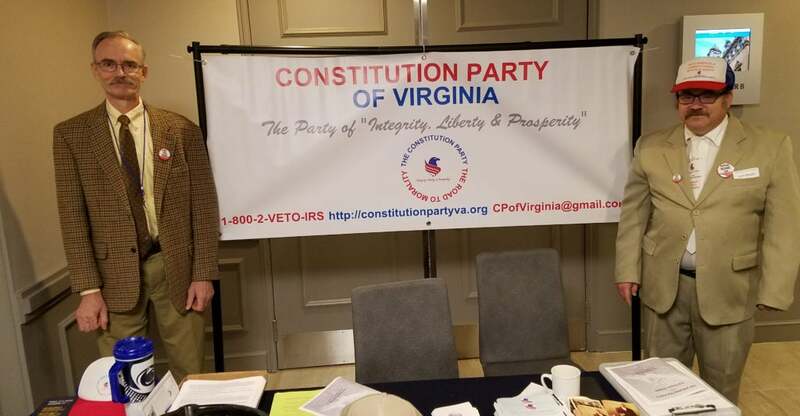 The Constitution Party of Virginia also had a presence at the summit. The chairman, Newport News resident John Bloom, tells The Daily Signal that he supports the tea party and thinks it should remain independent. Burke resident Paul Provance, vice chairman of the Virginia Constitution Party, is retired from the U.S. Department of Agriculture.